Yuzhno-Russkoye onshore oil and gas condensate field is located about 2,175 miles (3,500km) north-east of Moscow, the capital city of Russia. It is the largest natural gas field developed in the country. It is spread across an area of about 460 square miles (1,191 square kilometres) in the Krasnoselkupsky district of Yamalo-Nenets Autonomous Okrug, in Western Siberia. The Yuzhno-Russkoye field was put into commercial production in October 2007 and was officially commissioned two months later, in December. It produced its hundred billionth cubic metre of gas in May 2012. "It produced its hundred billionth cubic metre of gas in May 2012." Severneftegazprom is the operator of the Yuzhno-Russkoye. It was established in 2001 as a subsidiary of the Russian energy company Gazprom, to develop the field. Gazprom has 50% ownership in Severneftegazprom. The remaining half is shared equally by the German companies Wintershall Holding, a wholly-owned subsidiary of the chemical group BASF, and E.ON Exploration & Production, a subsidiary of E.ON Group. The stakeholders are investing approximately €1bn ($1.3bn) to develop the field. Yuzhno-Russkoye is one of the largest deposits in Russia, with total reserves exceeding one trillion cubic metres of gas. Preliminary estimated reserves are put at 180.9bcm of gas and 20.35 million tons of oil and gas condensate. The gas deposits are situated at depths which range between 700m to 3,000m. The plateau production was reached in August 2009, about 12 months ahead of schedule. The field currently produces about 70bcm of natural gas each day through 142 wells. The annual production capacity is 25bcm. The production is expected to exceed 26bcm in 2012. Yuzhno-Russkoye reservoir was discovered in November 1969. Detailed seismic studies on the reservoir’s Lower Cretaceous and Jurassic deposits were conducted in 1979 after the initial estimates were validated by the State Committee on Reserves of the former Soviet Union. "Yuzhno-Russkoye is one of the largest deposits in Russia, with total reserves exceeding one trillion cubic metres of gas." The second phase of prospecting and exploratory drilling was started in 1990 and preparation for the development of the field began in 1997. TyumenNIIgiprogaz, a research and design firm, developed a project in 2004 to mine the Cenoman and Senon deposits and open up the reservoir. In the same year, a project to develop the field was completed by YuzhNIIgiprogaz, a design and engineering survey institute. Construction work on the Yuzhno-Russkoye field infrastructure was started in January 2006. In September 2007, the field was connected to Gazprom’s Unified Gas Supply System (UGSS), the world’s largest gas transmission system. Commercial operation of the field was started in October 2007. The first exploratory well in the Turonian deposit, which is located within the Yuzhno-Russkoye reservoir, was drilled in July 2010. The first gas from the exploratory well was tapped in May 2011. The first gas from the Turonian deposits was transmitted to the UGSS in December of the same year. Commercial production is expected to start in 2025. The Nord Stream Pipeline received first gas from Yuzhno-Russkoye in November 2011. "The first exploratory well in the Turonian deposit, which is located within the Yuzhno-Russkoye reservoir, was drilled in July 2010." 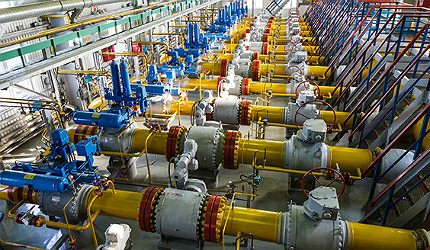 Yuzhno-Russkoye gas treatment complex is one of the most sophisticated facilities in Russia. It is an automated facility outfitted with modern national and international equipment and technology. Equipped with a special instrument base, a complex telemetric system and latest software from Siemens, the automated control system handles technological processes in basic and ancillary production using a single panel. Its instant notification system avoids unusual and emergency situations from developing. The eight natural gas absorbers / dryers are fitted with internal devices which trim down the carry-over of triethylene glycol, improve the quality of gas dehydration and increase the productivity of the machines. The booster compression station is installed with four Ural gas compressor units featuring gas injectors with an electric drive manufactured by ISKRA, a magnetic suspension system from S2M and a dry gas compressor from John Crane. For undisturbed and accurate measurement of gas flow, the facility is installed with FMC’s MPU 1200 high-precision ultrasonic flow meters. A captive power station installed with independent gas turbines manufactured OPRA Turbines supplies power to the field. The ESPO (Eastern Siberia Pacific Ocean) oil pipeline will be a 4,700km (2,900 miles) pipeline system. 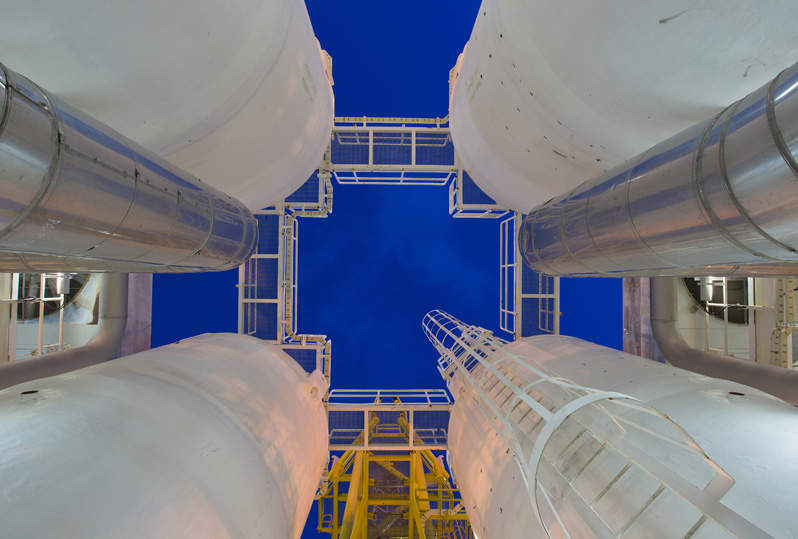 Yamal liquefied natural gas (LNG) project includes the development of the South Tambey (Tambeyskoye) gas field, located near Sabetta in the Yamal peninsula in Russia. The 169km Dzuarikau – Tskhinvali pipeline is one of the highest in the world, having been built in highlands of more than 1,500m in height.